Six-time champion Steve Davis failed to reach the World Championship as he lost 10-4 to Fergal O'Brien in the first round of qualifying in Sheffield. 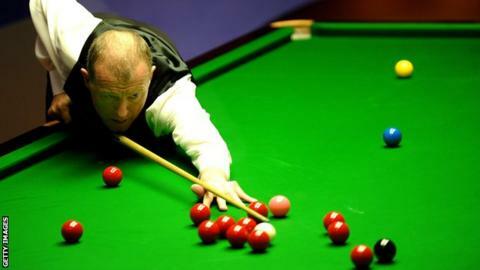 The 58-year-old, who has slipped to 100 in the world rankings, failed to make a half-century break at Ponds Forge. China's Ding Junhui defeated Ireland's Greg Casey 10-4, while compatriot Liang Wenbo beat England's Joe O'Connor 10-2. There are three rounds of qualifying, with 16 qualifiers joining the world's top 16 at the Crucible from 16 April. Davis' last appearance at the Crucible showpiece came in 2010, when he produced a surprise run to the quarter-finals before being beaten by eventual champion Neil Robertson. Ding, an 11-time ranking event winner, is playing the qualifiers for the first time since 2007 after a disappointing season that has seen him drop out of the top 16. Two-time Crucible finalist Ali Carter is also through to the next stage of qualifying.